ALLENTOWN, PA-- It already seemed like a regular thing at Coca-Cola Park on Thursday as buzz-worthy prospects Rhys Hoskins and Scott Kingery each slammed a home run for the Triple-A Lehigh Valley IronPigs. Both players continue to fuel Phillies fans' desire to see them playing at the top level of the sport with similarly explosive offensive production. Invitations for Hoskins and Kingery to play on a big league field came this week, but it wasn't precisely what the home faithful were hoping for, as the duo was chosen to play in the MLB All-Star Futures Game. The annual exhibition, which began in 1999, features top prospects from all around professional baseball. It is slated to be played at Marlins Park in Miami on Sunday, July 9th as part of Major League Baseball's All-Star festivities. The game pits talents from the United States against players from the rest of the World. 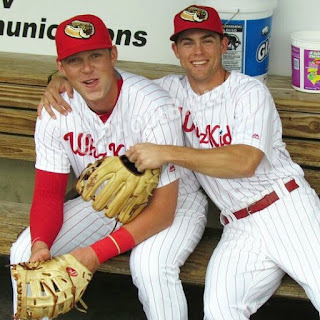 The pair of Phils prospects has somewhat paralleled one another on their paths up the developmental ladder, with Hoskins moving up swiftly after signing as a 5th round draft pick in 2014 and Kingery doing the same after he was a 2nd round selection in 2015. Hoskins, who is batting .303 with 19 home runs and 63 RBI through 80 games with Lehigh Valley this season, is looking forward to sharing the experience with Kingery, his spring training roommate. "It's fun to share it with somebody you know and I've gotten to know Scott pretty well," Hoskins stated. "It'll be great. We'll try to soak as much of it as we can in and see what it has for us." The 23-year-old Kingery, who is batting .314 with 21 home runs, 50 RBI and 20 stolen bases in 73 combined games between Double-A Reading and Lehigh Valley this year, was thrilled about being selected to the Futures roster. "Obviously, I'm super excited about it," Kingery shared with a smile. "I mean, It's a high honor to be named to that game and to just have the opportunity to go play beside Rhys and all the other talented guys that are going to be there, that's pretty special. It's going to be a good time and I get to go and represent the Phillies, so that's going to be awesome." The 24-year-old Hoskins was also named as one of five IronPigs representatives in the Triple-A All-Star Game. He'll be joined by slugging outfielder Dylan Cozens, catcher Jorge Alfaro, starting pitcher Tom Eshelman and closer Pedro Beato. Hoskins plans to attend that game as well, slated to be played in Tacoma, Washington on Wednesday, July 12th. "Those are things that come with being good. People want you and you're being pulled from all directions," IronPigs manager Dusty Wathan said of Hoskins' demanding All-Star schedule. The team's skipper, who coached Hoskins and Kingery last year with Double-A Reading, feels that Hoskins is a bit of a mentor for the younger Kingery, also citing similarities between the two righty hitters. "I think Kingery feeds off of (Hoskins) a little bit. I think he looks up to him a little bit as far as he's always been just ahead of him. So, I think each time he's come up-- I think last year, Kingery could go to Rhys and talk about pitchers. I hear them talking about pitchers and stuff all the time...I think they're very similar personalities, very even-keeled and very well prepared," Wathan stated. Shared traits, especially if they involve continuing to launch round-trippers and getting runs across the plate, are things that Phillies fans could really get used to from these two catalysts. While both players can be similar at the plate and with their game preparation, they're a bit different with what they are looking forward to aside from the Futures Game itself, in Miami. Hoskins would like to cross paths and spend time chatting with some big league All-Stars. Kingery has something different in mind, expressing interest in meeting some of the competitors in the Celebrity Softball Game. Perhaps Kingery knows the MLB players typically don't arrive in the host city until Monday and that the Futures may depart by then. Maybe Jaime Foxx and Flo Rida are closer to Kris Bryant and Bryce Harper than anyone besides Kingery realized. Either way, cheers to both Rhys and Scott for continuing to be the same but also totally different while doing the Phillies proudly. In other "moving on up" news...Outfielder Nick Williams has been promoted to the Phillies from Lehigh Valley. The 23-year-old lefty batter has tallied a .280 batting average with 44 RBI in 78 games for the IronPigs this season. Acquired as part of the return in the 2015 trade that sent Cole Hamels to Texas,Williams was the Phillies' 3rd ranked prospect headed into this season. Williams was already on the team's 40-man roster prior to this move.